Pinctada Maxima. Commonly known as the yellow lip oyster (or gold lip), this very large oyster produces yellow to golden colored pearls. Deep golden pearls that are perfectly round without markings or ‘flaws’ are the most expensive of all pearls because of their rarity. Each oyster can produce a maximum of up to four pearls ranging in sizes from 8mm to 18mm with the cultivation time of one to two years — very few produced will have a strong golden color and of gem quality. 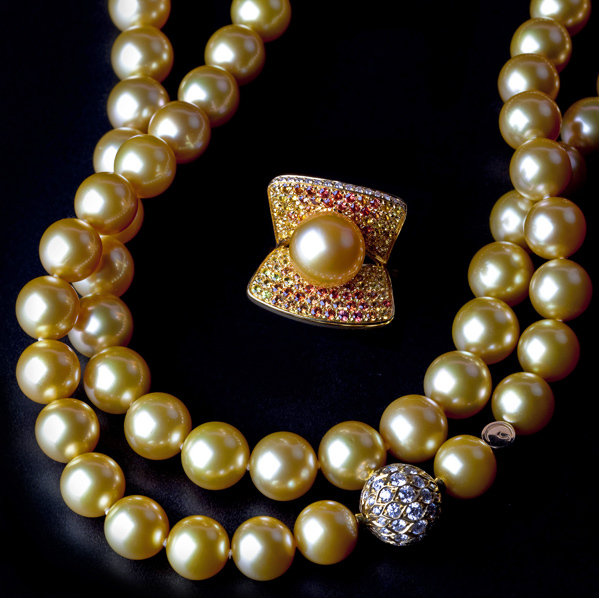 This 32 ½” strand of flawless and the perfectly matched seventy six pearls range from 10mm to 10.9mm are true gems. The 18k gold clasp has full cut round 2.07ct. VS quality diamonds. The custom ring, designed by Schoeffel Pearls, resembles a clam shell with a total of 2.46 carats of yellow, golden and orange sapphires paved in 18k yellow gold with a 12mm gem golden south sea pearl in the center. The edge of the ring is paved with .12 carats of diamonds.